Integrated Bridge: Hush, Hush ! 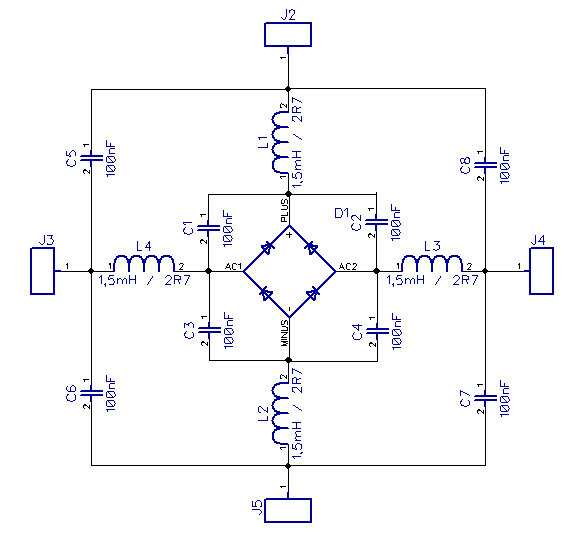 How can I achieve low noise rectification with a readily available integrated bridge rectifier ? Bridge rectifiers are readily available for the price of peanuts. They come as a grouping of all of the four diodes that are necessary to establish a Graetz rectifier bridge. But what about the noise that they introduce into the circuit ? Well, I have an idea with regards to such a dilemma. Let us treat the whole bridge as a source of noise. 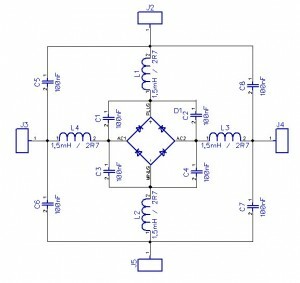 Now … what would you normally do with a noisy source of DC voltage ? Obviously, you would route it via a CLC filter, or a CRC filter, or a CRLC filter. So, the idea is as follows: let us put the Bridge, our “noise source” in the very middle of the drawing. Let us further assume, that each and every leg thereof (4 in total) is a potential culprit in terms of disseminating HF switching noise into the circuit. So what do we do ? We ENCAPSULATE. Let’s encapsulate the centrally positioned bridge with a isotropic and symmetrical (both vertically and horizontally) CLC type filter structure. The capacitors C1 – C4, are the closest to the culprits themselves. 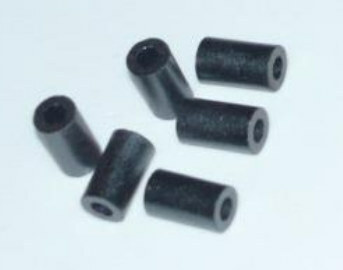 They are the “first” C within the CLC filter. Then you got L1 – L4, … as we go from the center of the drawing outwards … These are the “L’s” within such a symmetrical CLC filter. Last but not least, are C5-C8 … these would constitute the second “C” within our CLC filters. As we go from the middle outwards, we see that noise is virtually “contained” or encapsulated. It cannot leak to the outside, as all paths are barred.